1. Set these materials on a table and keep ready. 2. Next, fill the cup with clean tap water. (Cup should be clean with no trace of soap / oil). 3. Get a paper clip, and drop it in the cup. Does it sink or float? Drop the 1” piece of straw. Does it sink / float? 4. 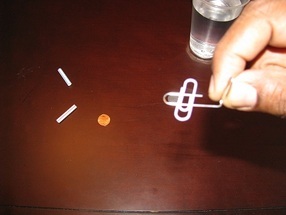 Now get another paper clip, and open it up so it can be used like a hook (see picture above). Use this “hook” to hold the third paper clip flat. 5. Move the hook over the water and gently try and place the clip resting on this hook. Try not to disturb the paper clip as you gently rest it on the water using the hook. What happens? Does it sink / float? You should be able to make the clip float using this method. If it does not, check the water it may have traces of soap or oil. 6. Now to make the clip sink without touching it, get a drop of dish soap on your finger and gently touch / apply to the water’s surface away from the clip. Observe and record what happens. 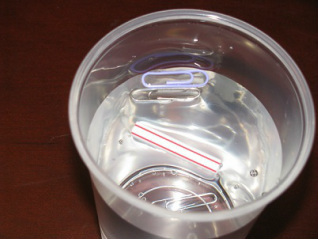 The paper clip now was made to float on the water’s surface, as does the straw. They are both light in weight. The water molecules bind together tightly at the surface, to form a protective layer or skin, that is hard to penetrate. If you pay close attention, you will see that the paper clip makes a depression on the water layer. When you get the soap near the water’s surface, the paper clip immediately sinks! This is because the drop of soap caused the protective layeror skin to be broken. This is called "surface tension of the water." Hence, the paper clip sinks. Now try the same experiment using different materials you find at home and record your findings. What is a molecule made of? Molecules are made up of even smaller particles, called atoms (like Lego's). Everything in this universe is made up of atoms. A water molecule is made of 2 hydrogen molecules and 1 oxygen molecule. It is also written as H2O.